Whether you’re looking for a vinyl cutter for your home hobbies or a small workshop, you’ve probably found that most of them are well out of the reach of the average user in terms of cost. While they may have lots of capabilities and can help you in just about any project you’re working on, you won’t always have thousands to spend on getting a professional grade vinyl cutter. For this reason, you’re limited to those that are within your budget and so you often have to sacrifice on one thing or another. Whether you’re able to buy just one part but are missing something important, or you settle for less than average quality, when you see what’s out there for a smaller budget it’s enough to put you off entirely. However, the latest bundle from USCutter offers everything you could ever ask for in a vinyl cutter along with all the bits and pieces that are required to make it work. 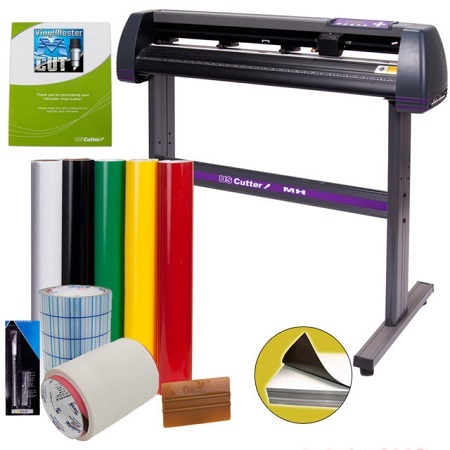 With this one bundle, you won’t need to shop around for the important equipment as it’ll all be delivered straight to your door and ready to g.
This compact but quality bundle is ideal for the home hobbyist, or any professional looking for a vinyl cutter but without a huge budget to spend on it. With this device in your arsenal, there’s no limit to what you can create and the projects you can finally complete. With a specific focus on vinyl cutters, the USCutter brand is known for creating quality and affordable cutters to suit all needs and users. Their Vinyl Cutter bundle features everything you could need to get started, so would be ideal for amateur vinyl cutters or those with years of experience. If you’re tired of shopping around for bits and pieces and want a product that has it all, the USCutter Vinyl Cutter Bundle is it. USCutter is also proud to offer lifetime phone support for their customers, so if you’re ever stuck with an operation question they’ll be there to help. This is the complete package for anyone looking to get started on vinyl projects, and it has all of the parts you could ever ask for from software to transfer tape and everything in between. As a number one best seller, it’s no wonder there are so many happy customers of USCutter. By far the best thing about this complete setup is just how cheap it is when compared to other devices, making it the perfect fit for anyone with a home workshop or hobby that could do with a quality but compact vinyl cutter. 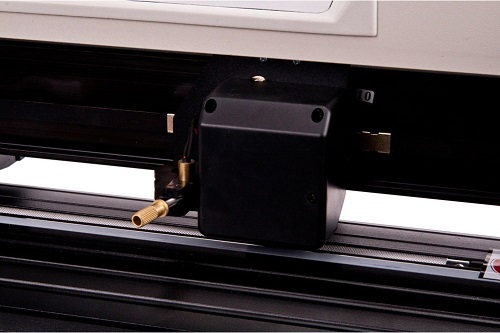 Because you’re spending a little less on it, don’t expect the USCutter Vinyl Cutter to be able to perform on the most intricate of cuts and details. However, for most projects, it’s more than capable of doing everything you need, and for the price, you really can’t pass it up. The unit itself is quite large, though, so be sure you have the adequate space if you’re a home hobbyist. One of the best things about the USCutter system is the customer service support. Unlike other brands where you’re stuck on your own once you make your purchase, the dedicated support staff is there to answer any questions you might have about how to use the machine and how to fix possible issues with the software. 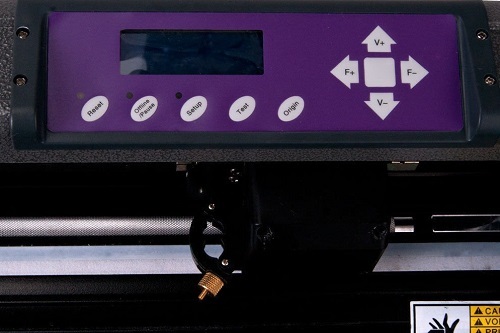 This is one feature you can’t put a price tag on and makes it one of the top choices for a budget friendly vinyl cutter. When you’re ready to get started on your vinyl cutting projects, you’ll want to know the easiest and most affordable place to buy the USCutter Vinyl﻿﻿ Cutter Bundle. When you head to Amazon right now, you’ll find they have it listed for a great price of under $300 which is far better value than you’ll find anywhere else. Not only will you get it for this low price, but Amazon will ship it directly to your door for free. When you consider how bulky the bundle can be as a whole, this is extremely great value for money. There’s no need to arrange for shipping and freight yourself, as Amazon can take care of the entire thing with just one click of your mouse. 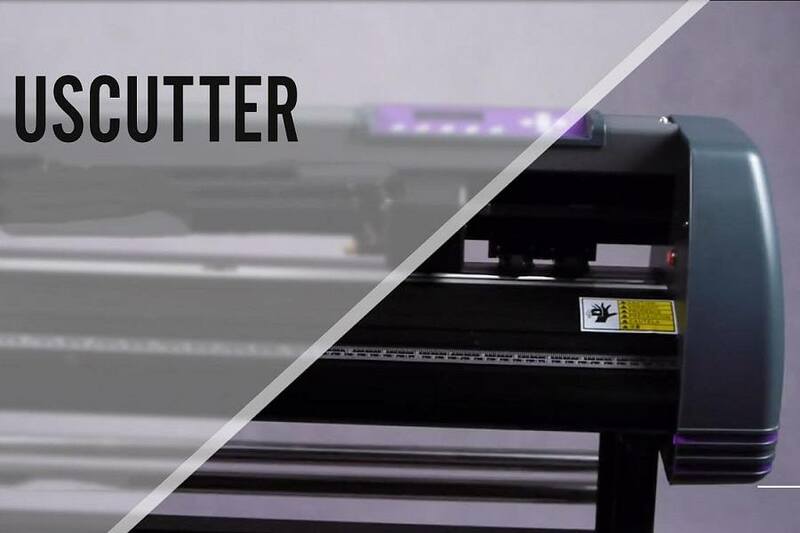 The USCutter Vinyl Cutter comes with a one-year limited warranty, and there is the possibility to extend this for another year for a price. However, when you consider the low cost you might just want to hold onto it and see how it performs over the first 12 months rather than spending on a warranty where you might want to upgrade your machine anyway. Whether you’re just getting started with some vinyl projects or need a solid machine to tide you over that won’t cost a fortune, you’ll be happy with the USCutter Vinyl Cutter Bundle. This complete package has everything you could ask for in a vinyl cutter, and all the bits and pieces to make it work. When you don’t have a lot of money to spend, but still want a decent sized machine with plenty of features, you can’t go wrong with this one.